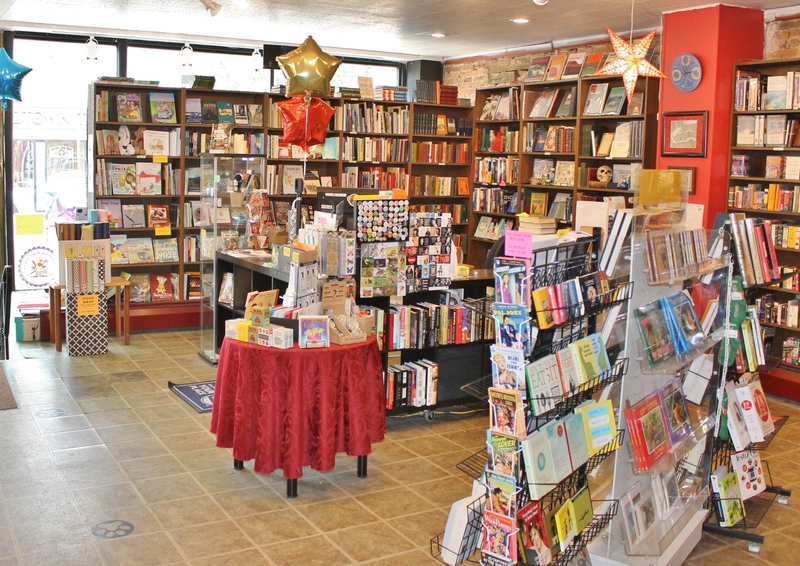 Located in downtown Kutztown since 2012, Firefly Bookstore is an independently-owned and operated new and used bookstore. Re-located in a bigger store in 2017, we now have almost 3000 square feet of space for over 65,000 items. We carry a great selection of titles including large sections of children's books, general fiction, sci-fi, mystery and thrillers, religion & metaphysics, cooking, history and biography. We have a selection of antiquarian titles and fine bindings. We also carry board games and puzzles (both new and used), toys, buttons, magnets, small gifts, note cards and each year, a large selection of calendars. We also offer free gift wrapping, customer requests and special orders. We can also provide dust jacket covering for any of our books. We buy and trade books whenever the store is open. We have regular events all year long, including author signings and book releases, events for younger children and family game nights. Subscribe to our email list or check on our Facebook events page for current upcoming events. We are closed three days of the year: Easter, Thanksgiving, and Christmas. If you are interested in selling books to us, we are able to look at books most times when the store is open. If you have a large collection, do call us to arrange an appointment. Special Orders: We can special order most new, in-print books, games, and other items from our distributors, most items arrive within several days. Direct Shipping: Most new titles, even ones we do not currently have in the store, are available to ship to you directly. Contact us by phone or at the store to order. Book Requests: We can be on the look-out for out of print and used books. Our System will notify us of a waiting customer when a title is traded in to Firefly. Holds: We are happy to put any item on hold for one week. Wish Lists: Birthday or other special event? Any item in the store can be noted as a wish list request. Your friends and family will be able to shop worry-free! Gift Wrapping: Free for all Firefly purchases. Please let us know in the notes field if you want your internet purchase gift wrapped. Dust Jacket Covers: For $1.00, we are happy to put a protective mylar cover on any dust jacket. Prison Shipping: For the price of shipping we will be happy to ship softcover books to inmates. We will need complete mailing address including ID#. Book Donations: Any book that we are unable to offer store credit for, we are happy to add to our donation boxes. We donate to the Louisa Gonser Community Library (Kutztown), the Leo Club/Kutztown Area High School Annual Media Sale benefiting the American Cancer Society, and The Friends of Berks County Public Libraries annual Book Bonanza sale. Do you sell textbooks for college? We don't carry most course textbooks, but we do carry assigned reading books for liturature, history, philosophy and education and other sections. For Education Majors, we have a fantastic children's literature section. We are also happy to look at books to purchase, so come in at the end of the semester to trade in books. Do you have a storefront I can shop at? Can I visit your location? Yes we do! you can visit us at 271 West Main Street in Kutztown PA. The material that is listed here on our site is not the same as what is listed in the store. If you live locally, and would rather pick it up at the store rather than have it mailed to you, please contact us. We cannot accommodate shoppers at the online location. I have a published book that I want to get in your store! Can I set up a store signing event? We do have local authors (Berks County PA) as a featured section, and we will, after evaluation, invite authors to sell their book through our store. Outside local authors, we also are constantly evaluating books to see if they are right for our store collection. You are welcome to send us an email with the book information (including ISBN) and we will take a look. If you have an author web page or social media pages, let us see those too. As for author events, we would make the observation that just inviting an author to our store generally does not generate sales (unless you are Neil Gaiman, J.K. Rowling, etc.). Signings are a great way to reward an existing audience. Building an audience means finding ways to make a book relevant or interesting. So if you are a local author and want to get your book in our store to sell, contact us. We send out emails 1-2 times a month with event announcements, news, current sales and special email-only offers. If you are interested, sign up here. We, of course, will never never never ever give, sell, trade or allow access to anyone else. This list is for our sole and very occasional use. Can I send you a list of what I'm looking for? We do track and maintain Customer requests. If you wish to send us an email, we can add your name and requested items to our database, and contact you when they are available. You are also welcome to use the Wish List feature on this site. Yes, we are actively seeking books for our store. If you are located within our area, we would be happy to discuss with you our availability to come pick up your items. We welcome inquiries from estate sales, moving sales, and store liquidations. Depending on the volume and type of material, and how far away you are, we will make an appointment to come to you. Please contact us for more information, or review our buying and trading information. I have a list of books to sell. Can you give me a quote for which books you want and how much you'll pay for them? We have had a long-standing policy of not doing quotes over the phone or by email. We do have customers that send us lists with the expectation we will pick and choose which ones we want and make an offer at that time. Due to the number of issues that such a process creates, we have to be hard and firm that we need to see in person all items the customer wants us to evaluate, and make an offer only AFTER we have selected the items we know we can use in the store. We realize that the prospect of packing everything and bringing them to us, having to wait, and if there are any returns, having to drive back to pick them up will seem daunting or inconvenient. We assure our customers that our intent is to make sure that everyone receives a careful and accurate evaluation of their books so they get good value in return. There have been occasions where a collection is generally in good enough overall condition and interest that we can quickly generate a per-box offer and just take everything. Certainly this is the most expedient approach but far less accurate. It is essentially a guesstimate approach based on what percentage of the collection we think we can actually use. We use padded envelopes and boxes for all our material. To protect fragile or vintage items from being damaged, we will add additional material, or cover. We can try to accommodate special requests, please contact us at time of purchase. Due to shifting shipping rates, we have established flat rate pricing based on average shipping weight. Items that are lighter (ship at less than 3lbs) may qualify for reduced shipping. Please contact us if you have any questions or would prefer a shipping quote. We offer Standard (via USPS Media Mail) or expedited (Via USPS Priority). Do you have volume or other shipping discounts? Bulk shipping may require additional postage or handling. If you are making a purchase of a very large number of items, we may be able to offer some discounts. If you live in the Kutztown area, (19530) we are happy to hold the book for pick-up. If you have other questions not answered here or on our shipping page, please contact us.